This gigantic spike buck was shot last fall in North Carolina by Dennie Bowman on his uncle’s hunting land. It has got to be one of the biggest spike bucks ever, or at least any that I have ever seen. Bowman set up on a hill and thought he was shooting at an 8 pointer that he had photos of, but after he shot and got a better look at the deer, he quickly realized it was not what he thought it was. Bluff Country Boys TV recently posted this photo of the buck and we were very excited to see it. 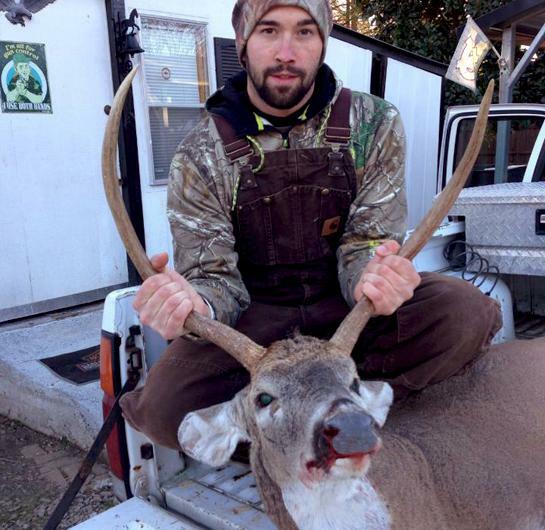 Bowman shot the buck on Thanksgiving morning close to daybreak in North Carolina with a Remington .270 rifle. When he shot, he expected a 7 or 8 pointer but never saw the deer except from the side. After the shot, the deer ran right at him and piled up below him and he realized it was the biggest spike buck he’s ever seen. Bowman’s uncle had never seen anything like it either in all of his years out hunting. The taxidermist that Bowman took the buck to has estimated the deer to be 10 or 12 years old. Sometimes when older bucks decline, their antlers shape differently and that appears to be the case. They can develop strange shapes and also have waves in them. In any case, Bowman said that he wouldn’t change a thing knowing the deer is a spike now. Have you ever shot a unique racked deer? Send us your photos and we’ll post them on our site and Facebook page.